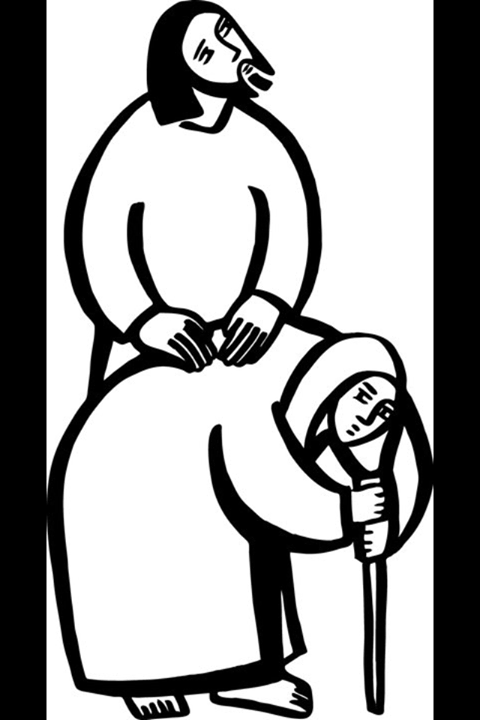 ‘And a woman was there who for eighteen years had been crippled by a spirit; she was bent over, completely incapable of standing erect. When Jesus saw her, he called to her and said, “Woman, you are set free of your infirmity.” He laid his hands on her, and she at once stood up straight and glorified God’ (Luke 13). It makes sense that Jesus touched where it hurts most, as he did with the blind man. But what I want to know is: Why does he look so bored? Would “Get thee behind me Satan” (Mat. 16:23) jokes be totally out of place here? This entry was posted in Comedy, Luke 13, Lutheran and tagged Christ, Comedy, God, Gospel of Luke, HolySpirit, Jesu, Luke 13, Lutheranism, Religion and Spirituality by cosmostheinlost. Bookmark the permalink.